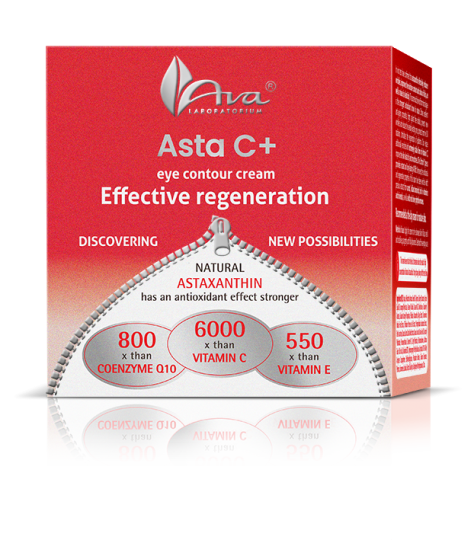 • 550 than vitamin E.
Astaxanthin used in the cream is the strongest antioxidant known in nature. It makes the skin smooth and velvety to the touch. As a result, the eye contour area becomes visibly rejuvenated and wrinkles are significantly reduced. 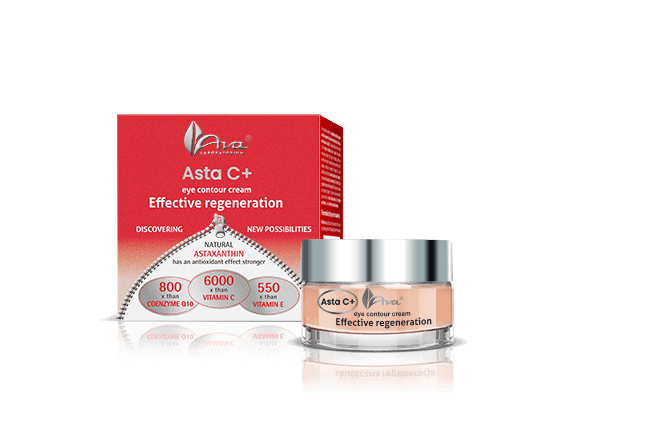 The cream alleviates swellings, accelerates epidermis regeneration, captures free radicals, reduces “crow’s feet” and rejuvenates the skin around eyes in general. 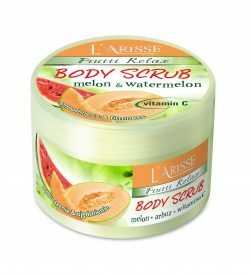 Vitamin C stimulates collagen production in the epidermis as well as strengthens anti-wrinkle properties of the cream. Additionally, natural oils softly lubricate the sensitive eye area, providing the right lipid balance in the skin which, in effect, becomes firm, moisturized, incredibly smooth and well-regenerated. 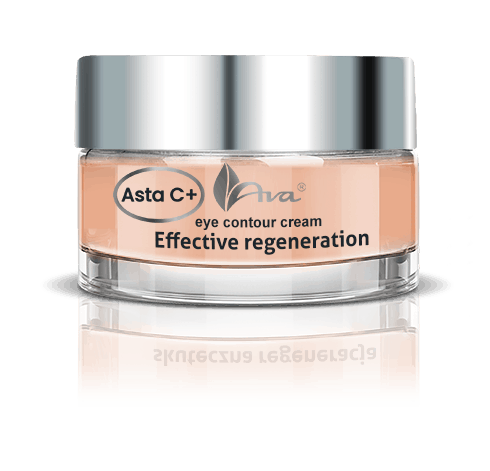 Recommended as day and night eye contour cream mature skin as. The cream does not stain. 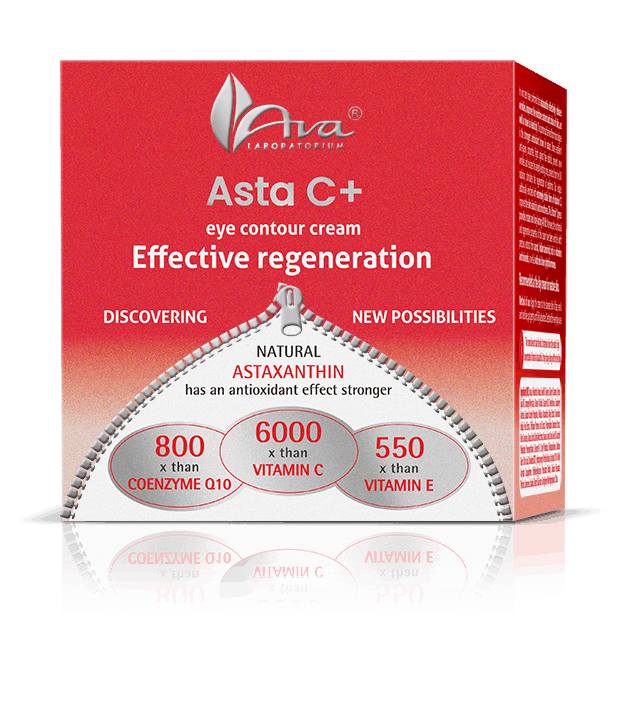 Its intense colour results from the high content of astaxanthin. Aqua, Glyceryl Stearate, Glycerin, Polyglyceryl-6 Palmitate/Succinate, Cetyl Alcohol, Coco-Caprylate/Caprate, Dimethicone, Prunus Amygdalus Dulcis Oil, Persea Gratissima Oil, Cetearyl Alcohol, Sodium Ascorbyl Phosphate, Olus Oil, Astaxanthin, Algae Extract, Tamarindus Indica Fruit Extract, Tocopherol, Phenoxyethanol, Xanthan Gum, Citric Acid, Disodium EDTA, Ethylhexylglycerin, Potassium Sorbate, Sodium Benzoate, Parfum, Limonene, Linalool, Benzyl Salicylate. Apply a small amount of the cream to the cleansed skin around eyes and pat gently until fully absorbed. Keep the distance from the conjunctival sac. Perfect under makeup. For everyday use.